This entry was posted in Detective fiction, Golden Age of Detective Fiction, Humdrum, Mystery, Novel, Quick Looks, Uncategorized and tagged Anthony Berkeley, Christianna Brand, Freeman Wills Crofts, J. Jefferson Farjeon. I highlighted this as one of my favorite Farjeons several years ago on my blog (I also reviewed Mystery in White, which, lo and behold, has gone on to some fame since). This is one of his best constructed books. I have the American edition in dj, don’t know whether I scanned that for my blog. I really enjoyed it. He did get a bit overboard with the courtroom scenes over 2/3 of the book but, you know, barristers and judges really did and do talk like that. As near as I can tell, he had the milieu and the language correct. The construction, as you say, is excellent. I have another one at hand (The Third Victim) that I’m actually enthusiastic about starting. I haven’t given him enough credit and it looks like there’s a lot of his books I haven’t read; something to look forward to. I first came to him, many years ago, as a result of an otherwise silly Elizabeth Linington novel called Greenmask! It is amazing how these seem to have come back into fashion – I only really knew him for his work in the cinema (as original author or co-writer). Glad to hear this one stands up – I take it it has not had a recent reprint though … yet? Very few editions at all and none more recent than the 50s, to the best of my knowledge. Let’s hope the success of his Christmas mystery encourages some reprinting. As of right now you can find a couple of reading copies through ABE at about the price of a new hardcover. 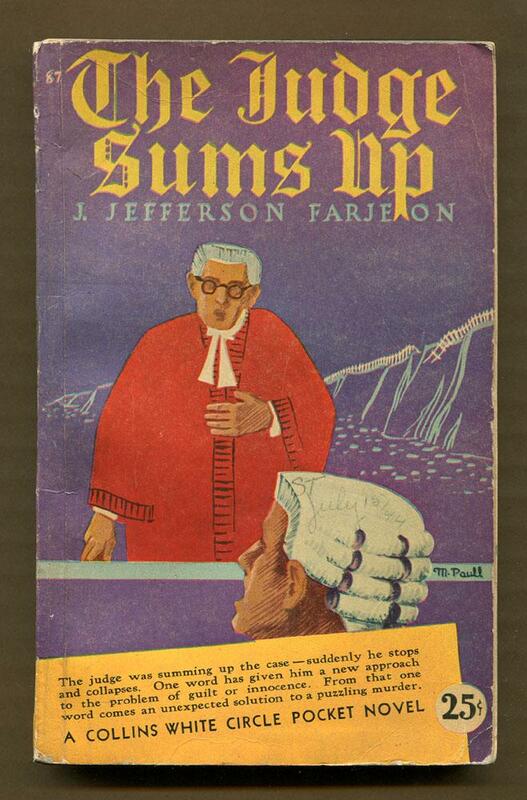 If I had any influence at BL this would be one of my top choices for reprinting (and I’ve read most of the Farjeon books, many of which are pleasant but routine–some are very good, however). The British Library have two Farjeon reprints due out September 3rd. Thirteen Guests and The Z Murders. If I could only have one I’d pick Thirteen Guests.